Here's a fun frugal craft! 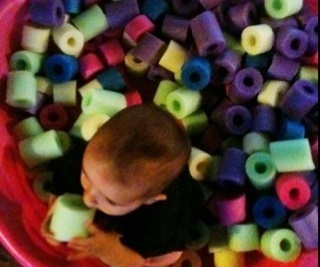 Would your little ones love a ball pit, but you don't want to spend the money? You just need a small plastic pool plus several pool noodles you cut up! Shop at the dollar store for your pool noodles, and you could probably make it for less than $15! If you make this one, let us know how much it cost you! NOTE - Children could bite off chunks of this foam, and result in a choking hazard. Best not to use it for children under 3 years old. For the little ones, you can buy a bag of 100 balls for under $18.00 and add them to your pool!